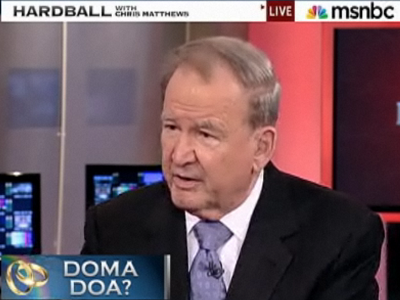 Pat Buchanan has finally been canned at MSNBC. The ousting was over Buchanan's controversial book, "Suicide of a Superpower: Will America Survive to 2025?" MSNBC's president Phil Griffin had asked Buchanan not to appear on the network while he was promoting the book, which includes ideas about the connection between ethnic diversity and America's decline that civil rights organizations have deemed racist and anti-Semitic. Buchanan has not appeared on the network since October. And now he's out for good. In a blog post for The American Conservative published today, Buchanan lashed out at the Anti-Defamation League and Color of Change for seeking his firing. It's interesting PJB is being punished for what he said, yet there has been no logical challange to the content of his message. Freedom of speech in America has been on life support for some time now with both the "liberal left" and the "neocons on the right" jointly participating in it's demise. They have different justifications, but seek the same end. He should consider that at burden lifted.